My cousin Catherine was born with a heart defect. She began having (then-experimental) surgeries to correct it at the age of two. She had many such surgeries and spent countless days, weeks, sometimes even months in hospital. The number of times she might have died are too numerous to mention. She never complained. She amazed everyone with her will to live. In addition to the surgeries and hospital stays, she took all kinds of prescription drugs and faced multiple challenges throughout her childhood and early adolescence: attention deficits, learning issues, and limits on what she could and could not do. She never complained. She made the most of life. 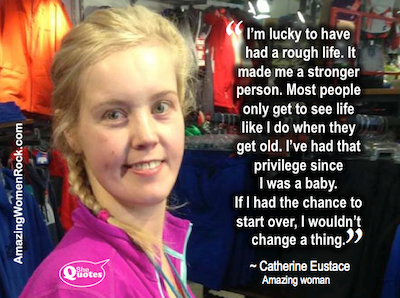 In her late teens, Catherine suffered a paralyzing stroke. She looked death in the face yet again. Death blinked. The stroke rendered her left arm and hand useless, impaired her ability to walk, and forced her to take even more medication. Unfortunately, over time, Catherine became unhealthily dependent on some of the drugs in the cocktail she had been prescribed by a host of doctors over the years. Had there been better communication between members of the medical “team” treating her various physical problems, the abuse may have been averted. She didn’t complain. Nor did she blame. She took the bull by the horns and made changes to turn her life around one more time. Catherine, who turned 30 this year, has worked as a (mostly seasonal) retail sales clerk for the last decade or so. When, because of her physical challenges, she couldn’t do some of the tasks her colleagues could, her employer wanted to terminate her employment. Predictably, Catherine didn’t complain. Nor did she blame. She became her own advocate, and, with the help of her union and social workers, she fought back. She won the right to work in a new administrative job with the same employer. Today and yesterday, Catherine and one of my other cousins, Liane, shopped for a knock-em-dead wardrobe that will help Catherine look and feel her best when she starts the new job next week. Catherine also got help to rationalize her prescription protocol, and get her personal life back on a more even keel. She sports a new brace on her left leg, one that allows her to move in ways she hasn’t been able to since before the stroke. Armed with her can-do attitude and guided by a personal trainer, she has begun to get fit, shed unwanted weight, build strength, and expand her horizons. Catherine is kind, loving, and generous. She is a beloved niece to my Mom, Pinkie Patti, and a supportive cousin to me, despite our 27-year age difference. Her courage and determination have inspired me for years. I thought it was time I tell her so. Here. In writing. For all the world to see. Hi Susan – I too have admired Catherine for years. I worked with her at Ski le Gap and always admired her fun-loving spirit, determination and that glorious “warm your heart” beaming smile. Thank you for writing this article – her story truly is inspirational and needs to be told. I met Cat at work and since the first time I knew there was something special about her and gosh I was right! Cat is so sweet, tender, funny and full of life that I feel privilege to say she’s become a friend; she’s my blond angel! (She knows I call her that) and we basically see each other almost every day but luckily we email each other during working hours (without abusing lol) …. We both are busy all the time but we made a deal that when the nice weather arrives we’ll go out and enjoy life outside work. I love you Cat, my sweet blond angel! Next readingI Wanna Be a MF-in’ Monstah!